Remembering Nadia Anjuman: One Day, My Hands Will Become Weavers. Nadia Anjuman was an Afghan poet (born in 1980, died in 2005). She was born in Herat, a city captured by the Taliban in 1995. 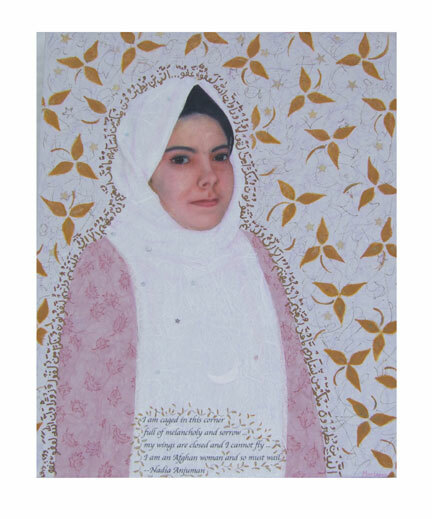 With no hope for continuing her education at that time, Anjuman rallied with other local women and began attending an underground educational circle called the Golden Needle Sewing School, organized by Herat University professor Muhammad Ali Rahyab in 1996. Members would gather three times a week under the guise of learning how to sew (a practice approved by the Taliban government), while in actuality the meetings enabled them to hear lectures from Herat University professors and lead discussions on literature. My first thought when learning about the Sewing Circle of Herat was very predictable – it reminded me of Dead Poets Society. The notion that they had to meet in secret to discuss literature and write poetry was terrifying and enchanting at the same time. Terrifying was the fact that they had to do it with such great risks, enchanting was that they did it in spite of that. In 2001, the doors of the girl’s schools were opened once again. Anjuman was admitted to the Literature Department of Herat University, and couple of years later, when she died, her brother recalled how that was the happiest time in Nadia’s life – “she seemed as though she’d been handed the whole world”. Her parents were supportive and respectful of her talent and she was adored by her brothers and sisters. Her writing blossomed and she published her first book of poetry, Dark Flower, four years later (2005). Unfortunately, Anjuman found herself in an unhappy marriage. Her husband, Farid Ahmad Majid Neia, graduated from Herat University with a degree in literature and became the head of the library there. Although he was a literature graduate, many of Anjuman’s friends and relatives claim Neia was not supportive of her writing. One night, in November of 2005, Anjuman and Neia had a fight. That night Neia beat Anjuman until she was unconscious, causing severe bruising and a cut to her head. It was reported that she died as a result of injuries to her head. Anjuman’s husband Neia was imprisoned after her death, but the tribal elders in Herat began to lean on Anjuman’s ailing father, asking that he forgive Neia for her death in order to shorten his prison sentence. With the promise that Neia would remain in prison for five years, Anjuman’s father relented. Her death was officially deemed a suicide by the Afghan courts, and Neia was released just one month later. Her father died shortly after from the shock, according to Anjuman’s brother. The Complete Poems of Nadja Anjuman were published by Iran Open Publishing Group in 2014. There are couple of English translations of Anjuman’s poems available online. She is now one of the dead poets, but the eternal pit of time will not be able to turn her greatness into the darkness of oblivion, I am sure of that. → Marking Veterans Day 2014: The Nature of War & The Letter From a Dying Veteran. ← Remembering Meena Kamal: Hope Is The Thing With Feathers.